Come to Williams as a Coe Scholar – a member of a select group of exceptional WBU students who participate in an enhanced undergraduate experience. Students admitted to the Coe Honors Program are women and men of outstanding academic achievement, high ideals and a scholarly heart. 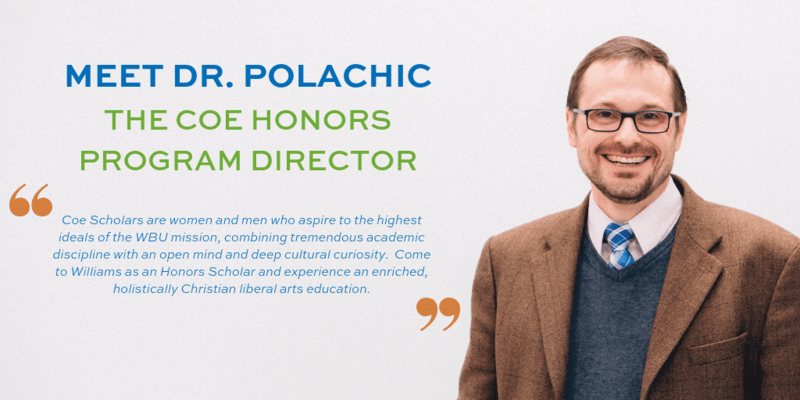 The Coe Honors Program is directed by Dr. Christopher Polachic, Assistant Professor of Natural Sciences in Physics, and guided by the faculty members of the Honors Council. The Coe Honors Program provides its Scholars with unique opportunities to learn and grow beyond our already thorough Williams liberal arts curriculum. Each semester, guided by WBU faculty and guest scholars, we engage together in a unique and eclectic schedule of activities both on and off campus, designed for intellectual enrichment and a deepening of our cultural appreciation across the arts, sciences and humanities. Learn how to reflect thoughtfully on master works of fine painting with a professor of art; attend a Shakespearean comedy with a seasoned veteran of the stage; visit a Civil War battlefield with a historian of the American South; have dinner with an oceanographer telling stories of international marine conservation; allow a mathematician to guide you through some of the wonderful and mysterious patterns in numbers. Each semester, Coe Scholars may apply to the Honors Council for financial support in the form of travel and study grants for well-defined, personalized extracurricular projects that will help them mature within the scope of their academic major. Past Coe Scholars have used grant funds to study the life of Alexander Hamilton through a plan of reading and attendance at the celebrated Broadway musical; participation in a conference on civil rights; support towards a summer historical tour of Russia; and training in worship arts. Throughout their tenure at Williams, Coe Scholars receive recognition in a number of ways. Perhaps the most important will be the day they claim their well-earned WBU diploma at our Commencement Ceremony: their membership in the cohort of Coe Scholars will be announced as they walk across the stage wearing the blue and silver Honors Cord. It will be noted on their official transcript as a designation of outstanding preparation and character that speaks volumes to future employers, search committees and competitive selection committees. After completing your application for the Coe Honors Program, please send the following recommendation form to 2 references of your choice.